Ack, senior moment, I meant to post I understand the original Old Overholt mashbill was approximately 60/30/10. Yes, but I omitted to say I believed that to be close to the original Old Overholt mashbill as opposed to the several different ones used by subsequent distillers. Of course it's likely the house yeast strains used were different as well. When you say original, do you mean all the way back to early 1800s when it was called Old Farm Rye Whiskey? There have been a lot of incarnations of the Old Overholt brand, so it is hard to pin down. Oh I donno Herman, talking off the top of my head (or is it through my hat) here. I am speaking of the Monongahela style ryes of yore and I believe the original Overholt falls into that general category. Forgotten my sources, could be M'Harry (pub. 1809) or some of the other practical distiller publications prior to 1850. I'm thinking that style produced the 60/30/10 mashbill but I could be crackers about that as well. We're just talking over drinks here anyway. Even if we could find an Overholt recipe from the 1810 -1840 period it would've been made in a pot still without a rectifying column using local ambient yeast and be completely different from what was made later. I understand you are basing your whisky on historical research and I applaud your efforts, wish more would do that. It would seem that is the best path to a unique product rather than try copying what Barton, Beam, BT, the Hill and others are already making so well. I like M'Harry's preferred mashbill, or perhaps it would be more accurate to say I'm intrigued by it, of 45% corn, 45% rye and 10 % malt. Wish someone would make that although I have no idea of what the whisky would taste like and face it, marketing may sell the first bottle but taste is what wins a following. Would like to hear what your sources think. It seems that early 19th Century mash bills were more a function of the harvest that year. As these operations became more commercial towards the end of the 1800s it seems that the distillers would focus in on specific mash bills. 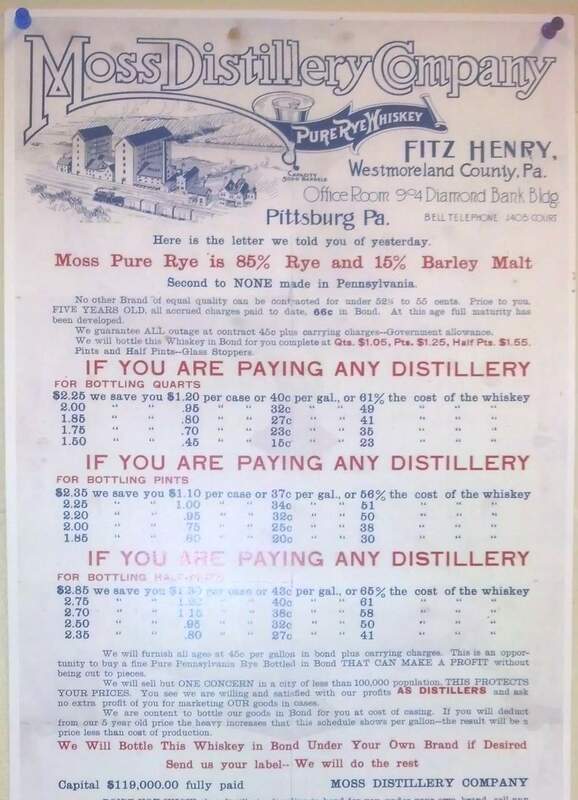 Many of the distilleries operating in PA just before Prohibition and just after were all rye grain (80-85%) and 15-20% malt (mostly barley but some were using rye malt, too). I think the Old Overholt recipe would have been the same. The common reference at the time was PA Pure Rye and these guys were doing rye grain and malt, no corn. Fascinating. Thank you for the information and for the link. That's my take on it, the early farm distillers were essentially using surplus grains locally sourced. Malt production however was done on a large scale for brewing well before column stills made industrial whisky distilling viable. I thought the term 'Pure Rye' referred to a blend of straight rye whiskies as opposed to a blend of rye whisky and neutral grain spirits. The term was also used for Maryland style Rye the mash bill of which contained corn as well. A friend of mine who is now in his 90s is descended from a family who once owned the largest Rye whisky distillery in Baltimore. His grandfather took him on tours of the place when he was a child and Bill remembers the bins of corn along with rye and malt. Doesn't recall much more than that though except that the product was labeled "Pure Rye". That would've been right after Prohibition but the place is long gone now along with all its records. Even if we could find an Overholt recipe from the 1810 -1840 period it would've been made in a pot still without a rectifying column using local ambient yeast and be completely different from what was made later. Also, barrel treatment and aging would be looser back then. I recall reading one or two mid-19th century guides on counterfeiting spirits that revealed that different coloring agents could be used for imitation rye, depending on whether the consumer wanted it white, lightly brown, or deep reddish brown. Imitation bourbon, by contrast, seems to have been treated with cochineal and tobacco extract to produce a reddish brown hue by default. Consumed unaged for the most part at least initially. Like Bourbon which followed, aged Rye was a product of the transportation system of the time. The Monongahela joins the Allegeny to form the Ohio river and whisky shipped downstream to was aged along the way. Sloshed about quite a bit in the barrels also. The barrels (new or repurposed) were cleaned (sweetened was the term) by burning straw in them which gave rise to charring as well. During the months of travel the whisky took on a different character and this is how 'Old Monongahela' whisky came to be. Of course eventually aging whisky on premises in warehouses became the practice. Herman any more of that stuff you can find would be greatly appreciated. I forgot to respond to your yeast question. I visited Dad's Hat this past weekend. It was my first distillery visit, so I learned a lot. Unfortunately, there was no distilling going on while we were there and Herman was not there at the time. -Most everything comes from the US. The grains come from PA and WI. The new barrels come from MO. The vermouth and port barrels come from CA. The still is one of the only non-domestic products, coming from Germany. They mentioned that Vendome was not making the size still they wanted at the time, which I believe was 2009. 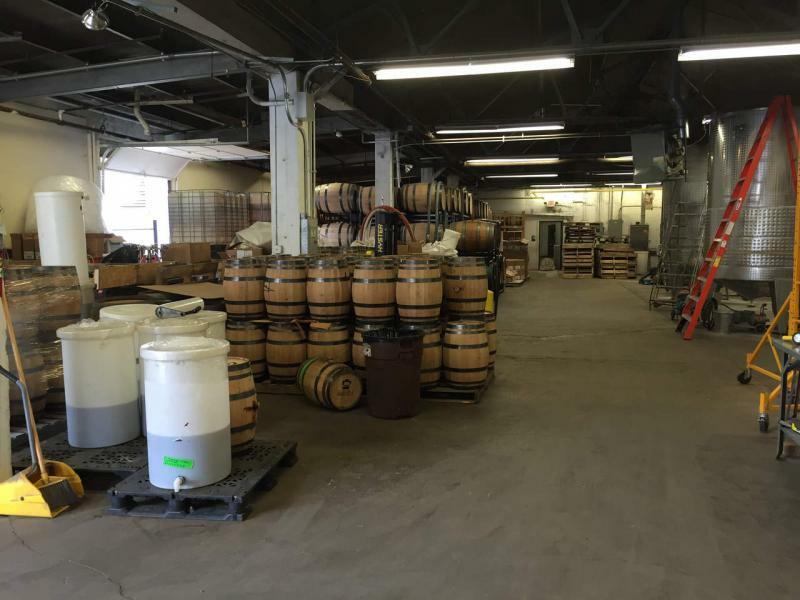 -They have both 15 gallon barrels and 53 gallon barrels aging. I read here that the 53 gallon barrels have a 3-char, but I thought I heard during the tour that the 15 gallon barrels have a 4-char. -The Pennsylvania Rye, I believe, only comes from the 15 gallon barrels and is aged 6-9 months, with the average around 8.5 months. -The Straight Rye from the 53 gallon barrels is 2 years old and will soon be bottled at 3 years old. -As of now, there are no plans for an extra aged Rye. At most, it will be 3-5 years old. -The tank used to hold the whiskey before bottling is never allowed to get below 1/3 full, in order to create a more consistent flavor profile. -The unaged white rye was actually very drinkable. I've had the JD Unaged Rye and thought it was the worst whiskey I've ever tasted, so I was shocked at how much I liked the unaged rye at Dad's Hat. It was recommended to us to be used as a substitute for tequila in a margarita, which I will definitely be trying soon. -I preferred the Port finish over the Vermouth finish. The port finish had a ton of dark chocolate and cherry notes. -The 2-year Straight Rye was very good. Lots of vanilla and rye spice. I bought a bottle since we can't get the Straight Rye in NJ yet, so I will hopefully post some better tasting notes soon. Overall, it was very cool to see a small, passionate operation. I will hopefully go back soon to try the 3-year old Rye. I only took 2 pictures, which I will add next. Good writeup and photos, thanks. Sorry I missed you. I had some personal business to attend to this past weekend. I am glad you enjoyed your visit. Good write up. Forgot to add: A second still will be added soon and aging will be moved off site since they've outgrown their current space. Congratulations on your success. I'll keep an eye out for Dad's Hat when next I drive cross-country. Great to hear about your expansion. I hope you consider raising your age limit a little - from what I've tasted, 8yrs does wonderful things to a rye. I look forward to trying your 5 in the future in any case. Nice pictures & write-up, Kyle. Thank you for taking the time. TBT, if you ever get to WashDC, Dad's Hat products are usually available at MSRP or thereabouts. What a great thread. Love the direct engagement - thank you Herman. Trying to squeeze a tour into a family trip - if stars and traffic align might be able to hit the last tour on the 25th. Looking forward to seeing the 3 year rye soon - and I'd love it if you started setting aside the occasional barrel for longer aging there aren't a lot of "current" 10+ year old ryes out there. We have had several questions about longer aging. While we generally prefer rye that is not too old and round, we may keep a couple around for a few more years. I don't anticipate going for 10. We like our rye to have a bit of an edge. For those of you who are in the Louisville area, we will be at a tasting event at the Middletown Commons Liquor Barn this Friday, August 31st from 4 to 7pm. Stop by if you want to taste and talk about our whiskey. Some interesting news to report. We have started a collaboration with Delaware Valley University, an agricultural school in our area, to bring back an heirloom rye grain cultivar called Rosen Rye. Rosen rye was introduced to the US just at the beginning of the 20th century and became very popular for whiskey and bread production. As both rye whiskey and rye bread became less popular, the production of rye grain in general and specific cultivars fell out of favor. We found many favorable references to this heirloom rye - including a mention on a rye whiskey bottle label - so we want to reintroduce it to local farms where we source our rye grain. DelVal obtained seeds from the USDA Seed bank to start their studies and the first cultivation has already been launched. 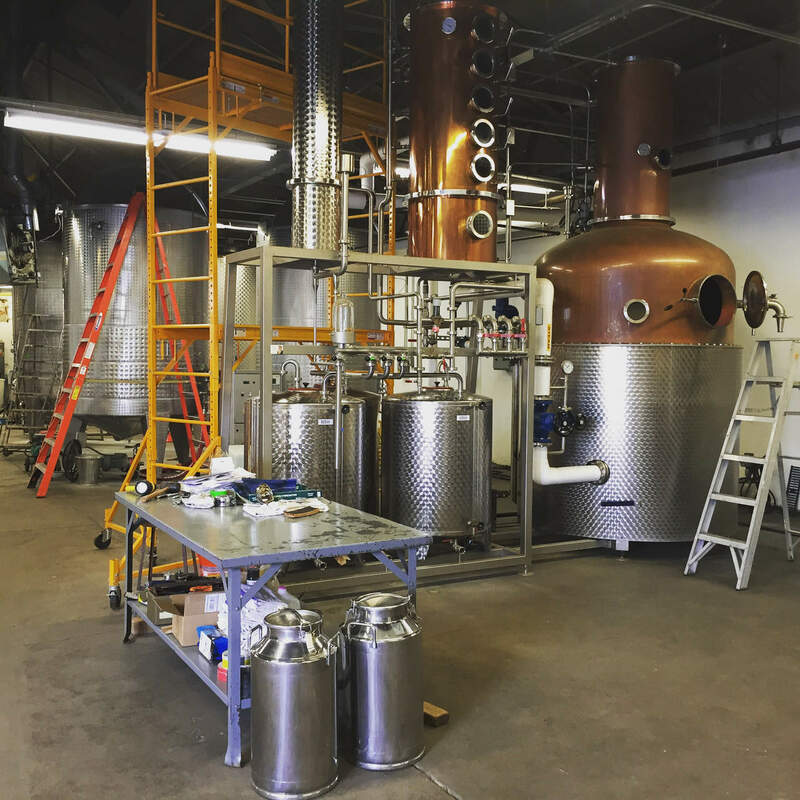 A lot more work to be done, but we are very excited about this opportunity to further improve the raw materials we use for our whiskey with an eye on improving even further our whiskey. By the way, the DelVal folks are also interested in working with local farms to support their efforts to enter a growing market place. Believe it or not, their are some very large distillers out there who are using grain sourced from Germany and sometimes Sweden. We want to get American farmers back in the game with this excellent rye grain.